In the previous four episodes of Season 10, we have seen aliens, a monster, and a sickly vigilante manifestation thingy, all of which have been typical in the daily lives of agents Mulder and Scully. However, Episode 5 titled “Babylon” strays from the paranormal to seek truth regarding religion and the power of suggestion. Leaving behind the UFOs and mythical creatures, the most unsettling part of last week’s episode is that it deals in real life concerns for our safety and shows how easily the ignorant can lead the naïve. If this were the average Law & Order episode, I would applaud it for its unbiased portrayal of the ongoing hate being spread by multiple sides in the U.S. But given that this sort of case seems outside of the jurisdiction of the X-Files unit, the episode appears misplaced. 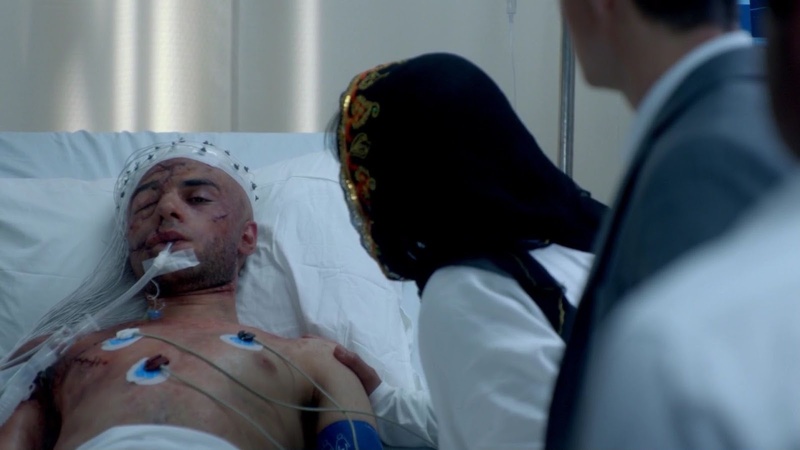 Opening with a young Muslim man kneeling and giving praise to Allah, it is already unfortunately obvious to foreshadow that The X-Files is about to plaster reminders of 9/11 like a desperate politician. But we are shown open-mindedness as the same young man then walks into the kitchen to drink a glass of milk and eat a peanut butter and jelly sandwich. Shiraz is not only portrayed as a regular American citizen but also as a human being rather than an “other” meant to be feared. Driving a short distance down a country road, Shiraz is alienated by passersby as if he is unworthy of the same rights and opportunities because he lacks a ‘Murican accent or a pasty white complexion. If only the rest of Texas only knew the similarities between deities. Shiraz meets with another Muslim man at a motel called Babylon and together they drive to a Southwest Texas building. Sitting in the car, both men say one final prayer to Allah as we, the viewers, brace ourselves for the tragedy yet to come. Shiraz and his confidant enter the building. Seconds go by that feel like minutes as the camera remains focused on the outside of the building, pedestrians roaming the calm quiet sidewalks. And then the silence is broken by a massive explosion. The building is now a skeleton of what it once was and the few survivors of the attack are running frantically through the streets in flames. Meanwhile, back in the X-Files unit basement office, Mulder and Scully engage in a religious debate when they are greeted by their younger doppelgangers, agents Einstein and Miller, who inform them of the Texas suicide bombing. It turns out that misguided Shiraz has miraculously survived his attempted attack and, with his life hanging by a thread, agent Miller is interested in communication with the nearly dead in hopes of preventing future attacks. Both redheads in the room remain skeptical of the idea but Mulder is filled with intrigue, eager to get his hands dirty in a little semi-necromancy. Please don't leave us alone with these two. 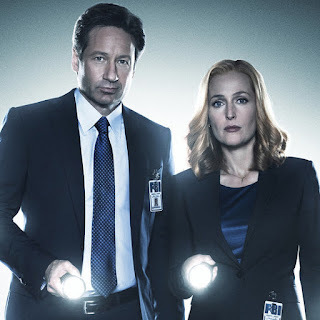 The two pairs of agents parting ways, Mulder and Scully make a classic switcheroo move without informing one another, Mulder partnering with Einstein and Scully with Miller. After her mother left the earth without answering Scully’s last few questions, she is curious to know if contacting the dead—or almost dead—is even possible. 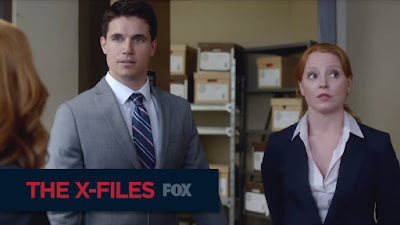 In one phone call, Scully tells Miller that she is on board with his plan and she sneaks off to the hospital in Texas where Shiraz currently lies. When Mulder finds out that Scully—in the company of Miller—beat her to the lone star state, he hops on the next plane to meet meet Einstein at the hospital. Mulder is confident that he has convinced her to administer a potent hallucinogenic substance to him that will allow him to communicate with the comatose Shiraz. And we all begin to question Mulder‘s sanity. Agreeing to administer the highly illegal drugs, Mulder takes two and doesn’t call Einstein in the morning. We see Mulder enter a Texas-style psychedelic trip, at first losing sight of his initial intent for putting himself in harm’s way. As he disappears from Shiraz’s hospital room, we see him dancing down the hall of the intensive care unit and high fiving doctors all the way to the exit. Suddenly, Mulder enters a club mostly full of over the hill Texans and proceeds to crash a line dancing performance. Finally remembering his mission on this wild journey, Mulder finds himself on a boat with people dressed in black hooded robes and at the head of the boat, Mulder sees a woman holding a bloodied Shiraz in her arms. Walking toward the woman to get a closer look, Mulder sees Shiraz mouth a few words to him but we do not hear any sound leaving his lips. What happens in Texas, stays in Texas? Awaking in a hospital bed with Einstein and Walter Skinner by his side, Mulder is reprimanded for his unauthorized mission to communicate with Shiraz through illegal substance use. Insisting that the drugs worked, Mulder learns that the pills that Einstein gave him were no more than placebos, the power of suggestion. Still convinced that whatever he ingested allowed him to reach Shiraz, he attempts to explain that Shiraz spoke to him while he was under the influence. Unfortunately, Shiraz was speaking in Arabic and without a translator Mulder could not prove what he saw. On his way back to Shiraz’s room, Mulder spots a familiar woman pleading with officers in riot gear to let her into the hospital. Mulder recognizes her as the woman from his hallucination, Shiraz’s mother. Rushing over to explain to the men in uniform that she is cleared to enter the hospital, the men pat her down and let her inside. Mulder escorts her to Shiraz’s room as she breaks down in tears upon seeing the physical damage that her son has caused himself. She goes on to explain that she did not raise her son to be a kind of martyr and that she never taught him to put other’s or himself in danger in the name of Allah. That is not what her god and her religion are about. Standing by her son’s side, Shiraz begins to seize and the lines on the hospital room monitor flatten. Mulder tries to explain that he predicted Shiraz’s death in his hallucination and again tries to tell the other agents that Shiraz spoke to him, but he is once again quieted. More mother-son sadness this season. When Miller reveals that he spent some time in Iraq and he is fluent in Arabic, Mulder finally has a vessel to translate Shiraz’s message. Officers in riot gear are sent to the Babylon motel and they break down the door, finding dozens of Muslim men and woman kneeling on the floor and each one is escorted outside and hauled away. Watching the action on the daily news, Einstein tells Miller about an argument she had with Mulder in the beginning of the case and admits that he was right all along. Words and ideas do in fact carry weight and the power of suggestion can prove to be deadly. Preparing to return to Washington, D.C. and the paranormal, Mulder and Scully take a walk together through a field as trumpets begin to sound from the sky. Alerted by the sound, Mulder looks up in wonderment… but by the puzzled look on Scully’s face, he knows that he is the only one who heard anything. Will Mulder have drug-induced flashbacks? Will agents Einstein and Miller take over the X-Files unit?